Grace Carney enjoys riding high at Free Rein Therapeutic Riding. Loki trots slowly through a clearing of spring-growth trees, his caramel color shining against the backdrop of prairie fields and blue skies. His home at Westar Ranch is a picturesque landscape of 110 acres, with white picket fences and horses the color of honey and dark chocolate. A Norwegian Fjord, Loki’s name means “the mischievous one,” but if you knew about his day job, you’d call him “Saint.” Three days a week, Loki helps individuals with physical, cognitive and emotional disabilities. “It takes a pretty special horse to do this kind of a job,” says Sandy Jones, founder and director of Free Rein Therapeutic Riding. Dressed in a ball cap and dusty brown boots, Jones is at ease on a horse as she is on two feet. Her nonprofit organization provides horse-assisted activities to riders with a variety of different ailments, including developmental disabilities, cerebral palsy and autism. In return, the rhythm, movement and personality of the horse gives riders an array of physical, mental and social benefits, Jones says. Jones was first introduced to using horses for therapy at Little Bit Therapeutic Riding in Woodinville, Wash. There she worked as a physical therapist assistant in hippotherapy — a physical, occupational or language therapy treatment that works with the movement of a horse. 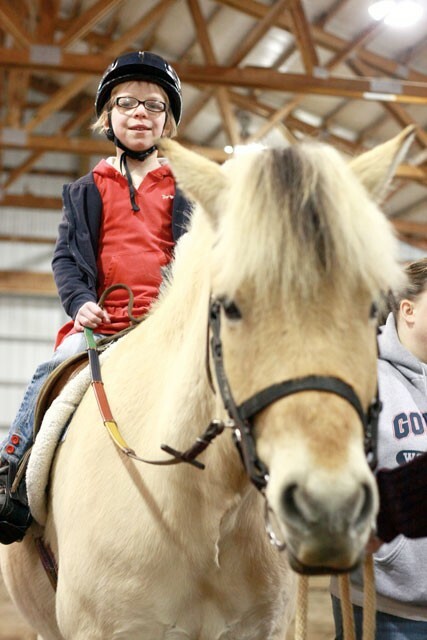 Unlike hippotherapy, Jones’ organization practices a recreation sport-riding model — one that emphasizes exercise rather than therapy — for individuals with disabilities. There is already an established hippotherapy clinic in Spokane at South Hill Physical Therapy. The majority of their riders are physician-referred and come from a core number of local doctors, says Michael Milanoski, general supervisor at South Hill Physical Therapy, although some insurance companies still balk at horse therapy. Instead of sitting in saddles, most riders at Free Rein sit on pads allowing the full movement of the horse to transfer to the rider, Jones says. For riders with higher cognitive and physical functioning, the goal is to use props and provide two-step activities. For example, riders are instructed to weave through a set of barrels and stop at a sign. Although benefits are unique to each person, Jones says riders generally gain trunk strength, communication skills, the ability to process directions and improved balance. Professionals in the field attribute these benefits to the warmth of the horse, the muscles used in riding and the multidimensional movement and rhythmic gait of a horse that mimics that of humans. Molly Coulter’s 18-year-old son, Scott, is the program’s most experienced rider. Cerebral palsy resulted in Scott being deaf and blind, with limited use of his arms and legs. He uses a wheelchair to get around. “Scott’s basically at the bottom of the barrel as far as ability goes,” Coulter says. “But riding has given him the opportunity to do things he couldn’t do before.” Since he began riding, Scott has improved his head control and strengthened his trunk and legs. His mom says his digestive system and his overall basic health have also improved.